Skin tags are fairly small flaps of skin that protrude from the surrounding skin on the body. 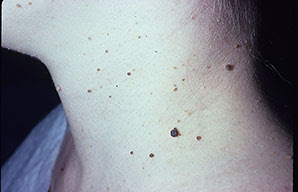 Skin tags vary widely in their color and shape. Some are smooth, while others are irregular and bumpy. Some are flesh colored, while others contain pigment that differs from that of the rest of the skin. Skin tags commonly grow on the eyelids, in the crook of the elbow, in the armpits and on the neck, but it is normal for them to appear anywhere on the body. Skin tags can appear either as a flap attached to the skin or on a stalk-like structure of skin called a peduncle. When skin tags are attached to the skin by peduncle, they look like little mushrooms with a firm stalk and a bulbous tip. 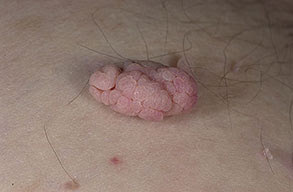 Skin tags are considered by dermatologists to be small tumors. However, they are benign, or harmless. 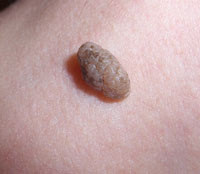 Normally, skin tags grow very slowly to a specific size, up to ½ inch long (1.27 cm), and then cease growing. A tumor that appears to be a skin tag, but grows rapidly and consistently, may be another kind of tumor that is malignant and possibly cancerous. Although unattractive, skin tags are harmless growths that appear mostly on adults beginning in middle age. Skin tags more commonly affect women than men. 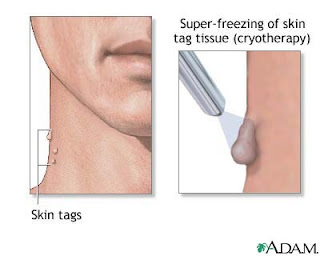 Skin tags are formed when an area of the outer layer of skin begins to overgrow and envelope collagen fibers, a type of skin cell that is firm and lacks elasticity. Skin tags are not a source of medical problems for most people, and they are most often painless. However, in some instances, skin tags grow on areas of the body where they may become irritated through friction with clothing, jewelry and other materials, causing scrapes and infections. 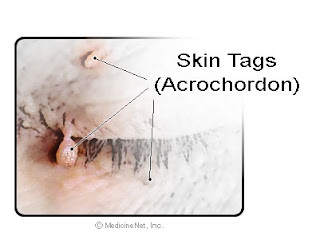 Some skin tags are located in areas that are bothersome, such as when they are attached to an eyelid, or are simply unwanted for cosmetic reasons. Skin tags can be removed safely and painlessly by physicians. Some methods of removal include freezing the skin tags off with liquid nitrogen or removing them with a scalpel or surgical scissors. Cauterizing or burning skin tags off is also effective. Once skin tags are removed, they do not grow back, although they may continue to appear on other parts of the body.